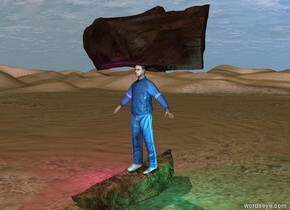 the big rock is in the desert. The athlete is 6 inches in the rock. the second big rock is 6 inches in the athlete. The magenta light is left of the athlete. the cyan light is right of the athlete. An emperor penguin facing backward. Behind the penguin is a huge baby facing backward. 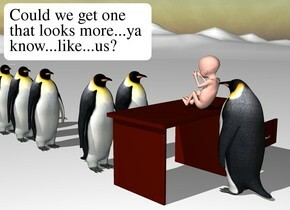 The baby is on a desk two feet in front of an emperor penguin. Another emperor penguin is to the left of the emperor penguin. Another emperor penguin is 2 feet behind the emperor penguin. Another emperor penguin is behind the emperor penguin. Another emperor penguin is behind the emperor penguin. Another emperor penguin is behind the emperor penguin. The ground is white. the camel is in the desert. the yellow light is above the camel. the small palm tree is 5 feet behind the camel. 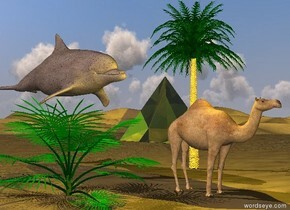 the huge dirt dolphin is behind the camel. it is left of the camel. it is above the camel. it is facing southeast. a 20 foot tall transparent yellow pyramid is 50 feet behind the tree. it is facing southwest. the camel is facing southeast. a green palm tree is left of the camel. The house is on the extremely tall purple mountain range. a white fence is 20 feet left of the house. it is facing right. 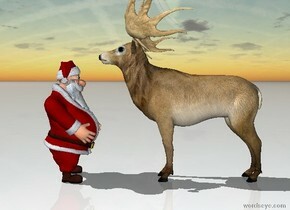 it is 100 feet long and 8 feet tall. another white fence is 30 feet behind the house. it is 100 feet long and 8 feet tall. a small willow tree is in front of the house. 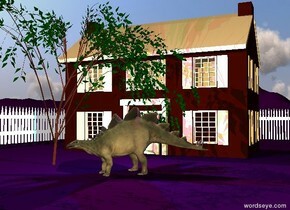 a small dinosaur is 5 feet to the right of the willow. it is facing southwest. a magenta light and a cyan light are above the dinosaur. the [hercules] pegasus is 5 feet above the shiny ground. it is upside down. it is leaning left. the arrow is -5 foot above the pegasus. it is face down. it is leaning to the right. the pig is 14 feet above the ground. It is 3 feet to the left of the pegasus. it is facing backwards. it is pink. the white wing is left of it. 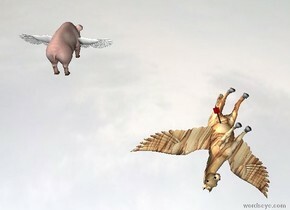 the second white wing is right of the pig. it is facing backward. the wings are 15 feet above the ground. they are large. 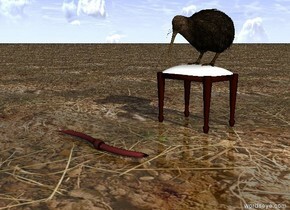 the kiwi bird is on the tiny stool. the ground is dirt. the huge brown worm is a foot in front of the stool. it is facing right. it is morning. 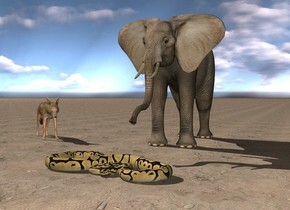 the python is in front of the elephant. the ground is dirt. it is cloudy. the jackal is 4 feet left of the elephant. it is facing the snake. the dirt ground. 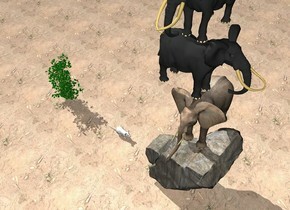 the small elephant is on the rock. a second small elephant is on the elephant. it is facing right. a third small elephant is on the second elephant. it is facing front. the enormous mouse is a few feet to the left of the rock. it is facing the rock. the bush is a few feet to the left of the mouse. the small bug is on the shiny tiny desk. the bug is on the small bug. a fly is on the bug. a bee is on the fly. a small dragon fly is on the bee. the very small shiny black computer is on the desk. 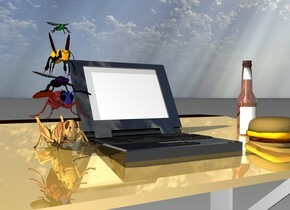 a tiny shiny bottle is a couple inches to the right of the computer. the tiny hamburger is in front of the bottle. it is cloudy. There is a [industrial] Utah. it is cloudy. it is morning. the orange lizard is -40 feet above the Utah. it is 400 feet long. it is facing right. the ground is water. 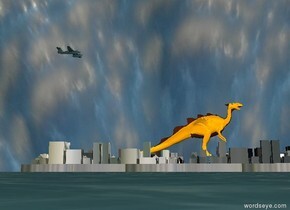 the huge airplane is 200 feet above and 200 feet to the left of the lizard. it is facing right. 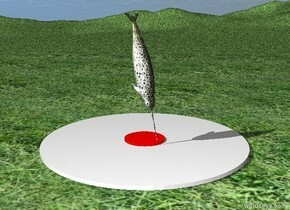 the large [color] fish is -1.5 feet behind the green cat. the cat is a foot above the ground. the sky is cloudy. the ground is shiny. the bowl is in front of the cat. it is on the ground. the blue light is 6 inches above the bowl. the red bird is in front of the bowl. it is facing the bowl. the 7 cats are 2 feet above the ground. the small red dog is one foot to the right of the cats. the dog is leaning to the right. the dog is 2.5 feet above the ground. 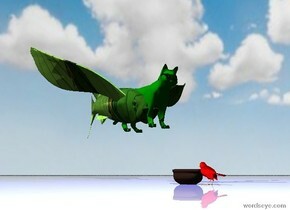 the 2nd small red dog is just left of the cats. the tiny pole is behind the cats. it is on the ground. it is cloudy. the ground is shiny dirt. the large fried egg is in the very large frying pan. 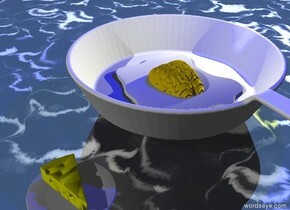 the small gold brain is 4 inches in the fried egg. the ground is shiny marble. the yellow light is to the right of the fried egg. the blue light is a few inches above the yellow light. the camera light is black. the small plate is 1 inch to the left of the frying pan. the yellow cheese is in the plate. the tiny man is on the ground. 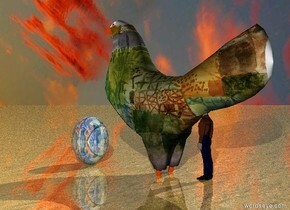 the large klee chicken is 2 feet in the tiny man. the man is -1.5 foot behind the chicken. the ground is shiny sand. the huge shiny matisse egg is in front of the chicken. it is on the ground. the egg is facing right. it is leaning 90 degrees to the left. it is cloudy. the [celebrity] wall. the table is 4 feet in front of the wall. the ground is shiny tile. 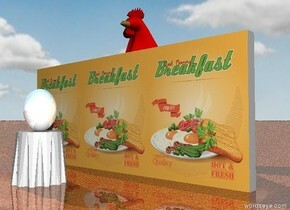 the chicken is behind the wall. it is 12 feet tall. the very huge shiny white egg is on the table. it is facing left. 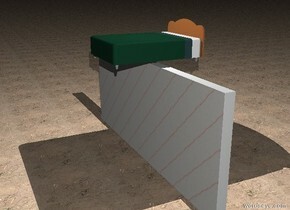 it is leaning 90 degrees to the left. it is cloudy. the tiny [andy] wall. the clown is 1 foot in front of the wall. the clown is 10 inches tall. 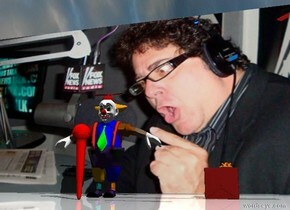 the small red microphone is 3 inches in front of the clown. it is facing the clown. the ground is shiny. it is cloudy. the tiny gift is 4 inches to the right of the clown. it is facing left. 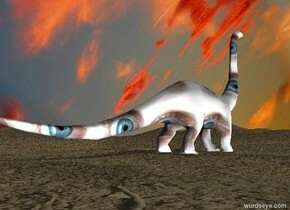 the [eyes] dinosaur is on the shiny dirt mountain range. it is cloudy. the housefly is in front of the butterfly. the grasshopper is in front of the housefly. the wasp is in front of the grasshopper. 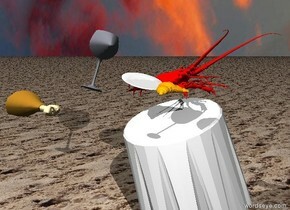 the scorpion is in front of the wasp. The stag beetle is in front of the scorpion. the spider is in front of the stag beetle. the walking stick is in front of the spider. the tiny rat is in front of the walking stick. the silver beetle is in front of the rat. 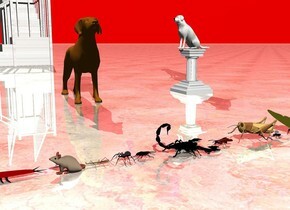 the small dog is 2 feet to the left of the scorpion. it is facing right. the ground is shiny marble. the small marble staircase is 8 feet to the left of the dog. the very tiny pedestal is 1.5 feet behind the dog. the tiny marble dog is on the pedestal. the sky is red. 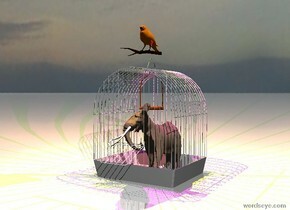 the elephant fits in the birdcage. the ground is shiny. it is cloudy. the bird is on the cage. the yellow light is above the bird. the magenta light is above the elephant. the shiny black mantel is in front of the shiny tile wall. the tiny shiny gold toilet is on the mantel. 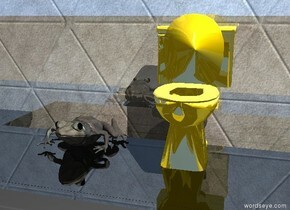 the stone frog is 2 inches to the left of the toilet. the mop. 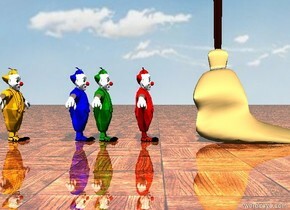 the very tiny red clown is 4 inches behind the mop. the very tiny green clown is 2 inches behind the red clown. the very tiny blue clown is behind the green clown. the very tiny orange clown is 5 inches behind the blue clown. the ground is shiny tile. the sky is cloudy. 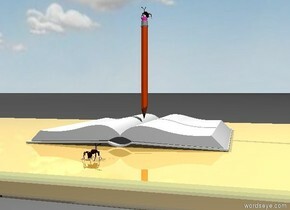 the large pencil. the mammoth fits on the pencil. 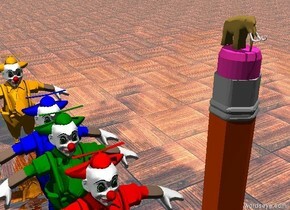 the very tiny red clown is 5 inches behind the pencil. the very tiny green clown is 2 inches behind the red clown. the very tiny blue clown is behind the green clown. the very tiny orange clown is 7 inches behind the blue clown. the ground is shiny tile. the sky is cloudy. 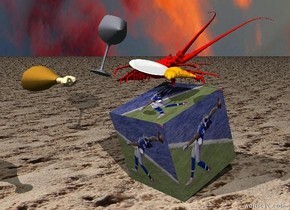 the large [odell] cube is leaning to the right. the huge red lobster is on the cube. the ground is sand. the large wine glass is 2 inches to the left of the cube. it is 3 inches above the cube. 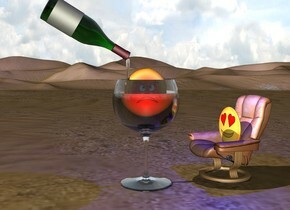 the wine glass is leaning to the left. the plate is 2 inches to the right of the wine glass. the plate is leaning forward. the orange croissant is 2 inches in front of the plate. it is cloudy. the large chicken is 34 inches to the left of the croissant. it is 5 inches in front of the croissant. the white book is on the shiny desk. it is facing up. the pencil is on the book. the ant is on the pencil. it is cloudy. the black ant is 3 inches in front of the book. it is facing backwards. the table is leaning to the right. the huge red lobster is on the table. the ground is sand. the large wine glass is 2 inches to the left of the table. it is 3 inches above the table. the wine glass is leaning to the left. the plate is 2 inches to the right of the wine glass. the plate is leaning forward. the orange croissant is 2 inches in front of the plate. it is cloudy. the large chicken is 34 inches to the left of the croissant. it is 5 inches in front of the croissant. the enormous rock is on the black shiny ground. a huge rock is 40 feet behind the enormous rock. It is facing right. the huge rock is 60 feet above the ground. the [texture] sky. the satellite is 5 feet above the enormous rock. the green light is 2 feet above the satellite. the blue light is 2 feet to the right of the green light. 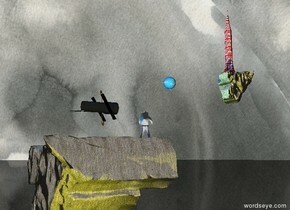 the very small flag rocket is on the huge rock. the huge globe is 40 feet to the left of the huge rock. it is above the huge rock. the large man is 10 feet behind the satellite. the man is above the enormous rock. he is facing the globe. the yellow light is 10 feet to the right of the enormous rock. the foam texture is on the mountain range. the man is 5 feet in the mountain range. the white light is 1 foot above the man. it is cloudy. the dog is 1 foot in front of the man. the dog is 2 feet in the mountain range. the woman is to the right of the man. the woman is 2 feet in front of the man. the woman is 5 feet in the mountain range. the huge silver sphere is 3 feet behind the man. the silver sphere is on the mountain range. 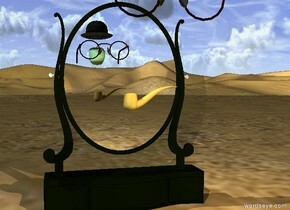 the silver sphere is to the left of the man. the very large white sphere is -1 foot above the silver sphere. the large grey sphere is -3 inches above the white sphere. the [buffalo] wall is 80 feet behind the silver sphere. it is to the right of the silver sphere. the ground is water. 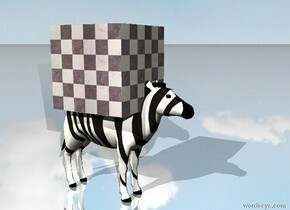 the huge checkerboard cube is on the zebra. the ground is shiny. it is cloudy. the bed is on the marble wall. the ground has a dirt texture. the white light is 4 feet above the bed. 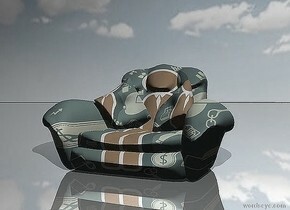 the [icon] armchair. The ground is shiny. it is cloudy. the chair is facing left. 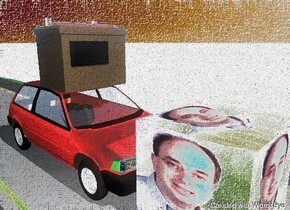 the huge battery is on the car. the car is on the long road. the huge zamchick is in front of the car. There is a table under a small willow tree. 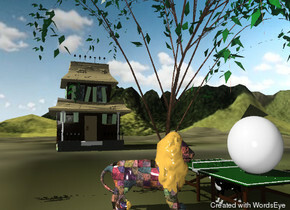 A lion is in front of the table. An enormous silver ball is on the table. the lion is facing the ball. it has a tile texture. it is cloudy. A haunted house is 30 feet left of the tree. it is facing the tree. the tree is on the grass mountain range. the mountain range is 200 feet tall. the ground has a water texture. A dog is under the table. 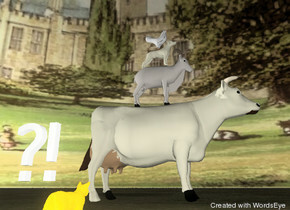 The goat is on the large cow. 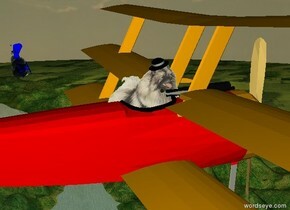 The dog is on the goat. The chicken is on the dog. The cat is on the ground. The animals are facing right. The cat is facing the cow. The cat is 10 feet in front of the cow. The huge grass texture is on the ground. The 7000 foot wide building texture is on the sky. 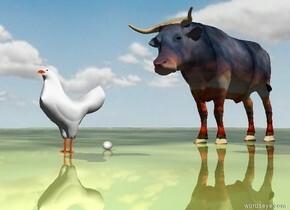 The cow is ivory. The animals are unreflective. The "?!" is above the cat. The "?!" is 2 inches to the left of the cat. The cat is bright orange. The dog is ivory. It is dusk. 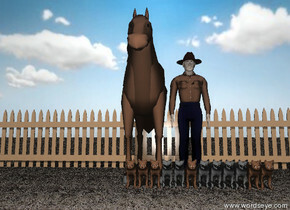 a cowboy is behind twelve cats. a horse is next to the cowboy. the ground is grass. the sky is partly cloudy. a wide fence is behind the horse. the horse and the cowboy and the cats are unreflective.